This page has been updated with new information regarding the event. The North Carolina Coastal Federation’s 2018 Low Country Boil is set to take place on Oct. 28 from 5-8 p.m. at the Hanover Seaside Club. The event will feature fresh shrimp, beer provided by Waterman’s Brewing Company and wine provided by SeaGlass wines, live music, games, a silent auction and raffle. One of the raffle items available is a bike from Two Wheeler Dealer. The other raffle item is an Allison classic longboard made by Will Allison. Will Allison is a North Carolina surfing legend, board maker and owner of Allison Surfboards. 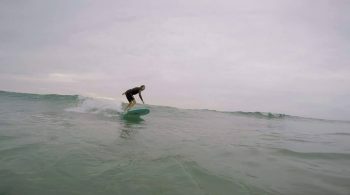 Allison grew up in the Wilmington area and began surfing along Wrightsville Beach when he was a child. After college, he spent time living and surfing in Hawaii, Louisiana and Florida, before settling back down again in Wilmington. Allison surfboard, Wrightville Beach. Photo by Alan Cradick, August 1, 2018. During his time in Louisiana and Florida, he began teaching himself how to make the custom surfboards he is now famous for. Allison has been shaping for the past 30 years. He was inducted into the East Coast Surfing Hall of Fame in 2006 and surfed for the United States team at the World Championships. He’s placed first in over 10 East Coast Surfing Championships and Eastern Surfing Championships and has won the United States Surfing Championship twice. Allison has also judged numerous surfing competitions along the coast. The board being raffled at this year’s Low Country Boil is from Allison’s personal collection and he never intended to sell it. A single raffle ticket for the surfboard is $10 or five tickets can be purchased for $40 at the event or online. Event tickets for the Low Country Boil are $50 for federation members and $60 for nonmembers. Guests will enjoy fresh local seafood and all the event has to offer, including two drink tickets with the option to purchase additional beverages. Tickets can be purchased at nccoast.org/boil. For more information, please contact Victoria Castor, donor engagement associate, at victoriac@nccoast.org or 910-509-2838.